*A version of this post originally appeared in the women’s newsletter for my church. March is Women’s History Month, which admittedly might sound a bit boring to those of us who aren’t history buffs. 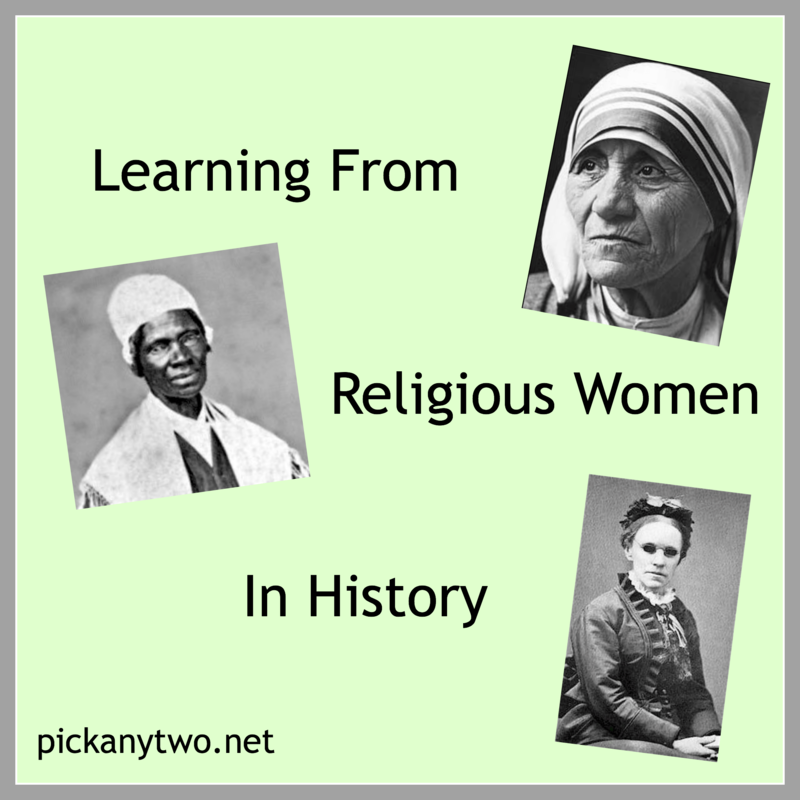 But the truth is that there is so much we can learn from the lives of religious women who came before us. Here are three of my favorite spiritual women from the history books. I hope their faith and actions inspire all of us throughout this month and beyond! Sojourner Truth is remembered as an African-American slave who escaped to freedom and spent the rest of her life working to abolish slavery and gain rights for women. But she was also a preacher whose religious beliefs underscored everything she did. For Christians, Jesus calls us all to stand up for the oppressed—to speak up for those who can’t speak for themselves—just like Sojourner Truth did. Who is Jesus calling you to stand up for right now? Tweet this! A lifelong Methodist, Fanny Crosby became blind shortly after birth. But she did not allow her lack of sight to stop her from fulfilling God’s vision for her life. Nobody is perfect; we all have failings, shortcomings, or challenges that we must face. But those challenges need not keep us from doing great work during our time here on earth. Indeed, those challenges can spur us to be even more loving to those around us. While she is well known for dedicating her life to helping the poor—which led to her receiving the Nobel Peace Prize in 1979—few know that her personal journals reveal periods of doubt in her faith. But any doubt she experienced was overshadowed by her dedication to follow her God each and every day of her life. There may be times when you question your faith; you wonder if your God really hears your prayers and loves you as a child. While those moments can be discouraging, don’t let them stop you from continuing to follow your heart. Put your trust in your God, and your faith will be renewed, just like Mother Teresa’s was. Tweet this! Which woman—from history or current day—inspires you? ‹ Does Your Doctor Make You Feel Guilty? › Breastfeeding is NOT a Sexual Act. Here’s Why. I am inspired by Mother Teresa and the love she showed to people who were essentially considered worthless. It puts things in perspective for me often. There are so many amazing women to celebrate during Women’s History Month, and you picked three great ladies! Every woman can learn from their examples. The first name that came up for me was Mary Shelley. Maybe it’s because my hub and I were discussing her at length yesterday or not. Let’s face it, she was brilliant and held her own with some of the best ever. Plus she listened to her dreams, which is where she came up with the idea for Frankenstein. Mary Shelley was definitely an amazing woman. She certainly did hold her own during a time when that was especially difficult to do. Loved this post! I have always been so inspired by Mother Theresa. She was so humble and yet touched so many lives because of the work God did through her. Thanks for sharing! I found Gladys Aylward a very inspiring woman. Her life encourages me because she didn’t have a lot of financial means but she didn’t let that keep her from achieving her goals to serve the Lord in China. A friend of mine who grew up in China as the son of medical missionaries had her as his babysitter. She didn’t consider herself to be special, just a servant of the Lord she loved with all her heart. She sounds like she understood the importance of humility, something that is undervalued in our culture today. Very inspiring! I have always been inspired by Mother Theresa. She touched so many lives. You really chose some wonderful examples of history! My daughter just wrote a paper on Malala Yousafzai – although she is only 16, I think she is an inspiring young woman. To have such bravery, poise, and determination at such a young age – just amazing. YES! She is absolutely amazing! Have you read Half the Sky? The book and subsequent documentary introduces us to Edna Adan, a woman who built a functioning hospital in a third world country servicing women in poverty. I’m talking women who would likely die in child birth or who suffered from genital mutilation. Women like that who work tirelessly to improve the lives of others inspire and humble me immensely. I’m familiar with the book but haven’t read it – I try to keep up with Nicholas Kristof’s work. I’m right there with you in that I am constantly humbled by women who have dedicated their entire lives to helping others and working to solve our world’s most pressing problems. A very interesting list! An inspiring woman who comes to my mind is Suu Kyi for her determination, though I can’t think of a religious figure. Oh Blessed Assurance and To God be the Glory are two of my favorite! This was a really cool look at women that I did not know much about! Fantastic post! These are great women to feature. I remember reading a lot about Sojourner Truth when I was younger. She’s fascinating.